ואם לא אפצח אותך, יהיה חבל. I like this and I like the versions leading up to it. The gradation of the colors in your words were nice to see.. not sure how you did that.. but nice. Ooooh! Such pretty light in this. 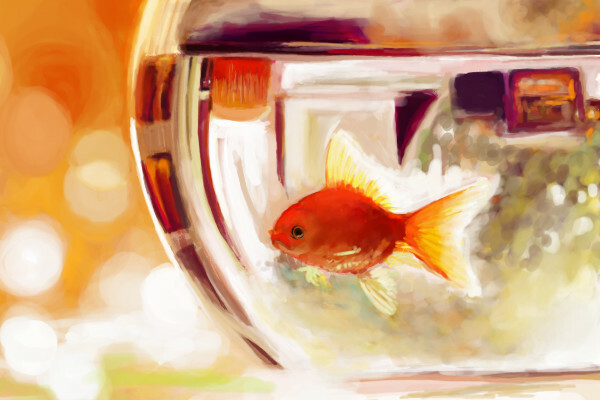 I like the angle you have drawn the goldfish. :) whole pic looks like a warm lit room. It's good. thank you :). shell, I don't fully understand lascaux either, but it's working nice with the use of several of it's features. This looks really nice, how you colored it and the shapes and everything looks awesome. what's a fish without an eye? A fish with a permanent bump on his head from hitting the glass over and over and over. Anyway, what a cutie! Love your coloring even more than the original. I always thought it was a fsh. yes! and How do you call a bear without an ear? beautiful. and wonderful painting, rendering,and the coloring is so nice. truly great use of light. Congrats on the recognition bestowed upon you by the mysterious Showcase faery. Well done, Shults! I hope you don't mind, I put this up as my desktop wallpaper,it makes a great wallpaper.. and I've been studying it, all the different colors and shapes, and it looks like real paint. The fish is perfecto.